The relation between runoff and sediment and land cover is investigated in the Cedar Creek Watershed (CCW), located in Northeastern Indiana, United States. The major land cover types in this watershed are cultivated land, woodland and pasture /Conservation Reserve Program (CRP), which account for approximate 90 % of the total area in the region. Moreover, land use was changed tremendously from 2000 to 2004, even without regarding the effect of the crop rotation system (corn & soybean). At least 49 % of land cover types were changed into other types in this period. The land cover types, ranking by changing area from high to low series, are rye, soybean, corn, woodland and pasture/CRP. The CCW is divided into 21 sub-watersheds, and soil and water loss in each sub-watershed is computed by using Soil and Water Assessment Tool (SWAT). The results indicate that the variations in runoff and sediment have positive relation to the area of crops (especially corn and soybean); sediment is more sensitive to land cover changes than runoff; more heavy rainfall does not always mean more runoff because the combination of different land cover types always modify runoff coefficient; and rye, soybean and corn are the key land cover types, which affected the variation in runoff and sediment in the CCW. 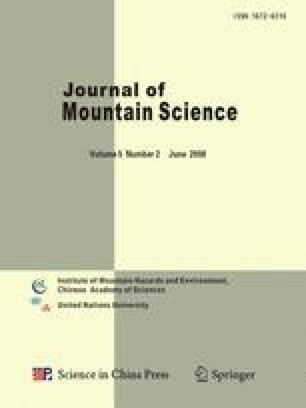 Research direction: application of Remote Sensing and Geographic Information System on mountain environment protection & development.